SPIRAL WRAP. Buy quality Auto and Marine Electric Parts and Accessories online, Sydney. 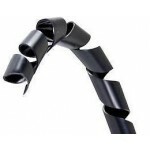 SW3B Spiral wrap 3mm (OD) Wrapping size 1.5mm ~ 10mm ⌀Black colour, UV resistantUse to bundle ha..
SW6B Spiral wrap 6mm (OD) Wrapping size 4mm ~ 25mm ⌀Black colour, UV resistantUse to bundle harn..
SW8B Spiral wrap 8mm (OD) Wrapping size 6mm ~ 30mm ⌀ Black colour, UV resistant Use to bundle ha..
SW8B/50 Spiral wrap 8mm (OD) Wrapping size 6mm ~ 30mm ⌀ Black colour, UV resistant Use to bundle..
SW10B Spiral wrap 10mm (OD) Wrapping size 7.5mm ~ 30mm ⌀ Black colour, UV resistant Use to bundl..
SW12B Spiral wrap 12mm (OD) Wrapping size 9mm ~ 32mm ⌀ Black colour, UV resistant Use to bundle ..
SW12B/25 Spiral wrap 12mm (OD) Wrapping size 9mm ~ 32mm ⌀ Black colour, UV resistant Use to bund..